RAMSAY, DAVID, sailor and fur trader; b. probably c. 1740 in Leven (Fife), Scotland; d. in or after 1810, probably in Upper Canada. 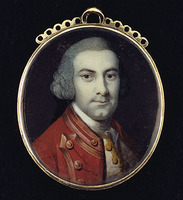 David Ramsay enlisted as a ship’s boy in the Royal Navy and served in the sieges of Louisbourg, Île Royale (Cape Breton Island), in 1758 and Quebec in 1759. Having been posted in 1763 to a British patrol vessel on Lake Ontario, he elected to remain in North America upon his discharge in 1765. At first he worked for an unnamed Montreal fur trader, journeying as far as the upper Great Lakes. In 1768 he was arrested by the commandant at Fort Niagara (near Youngstown, N.Y.) for causing some kind of trouble and was sent to Montreal, where he was held in the guardhouse for several days. In the fall of 1771 Ramsay undertook a trading expedition with his 17-year-old brother, George. They travelled from Schenectady, N.Y., to the mouth of Kettle Creek, on the north shore of Lake Erie, and from there went some miles upstream to winter with a group of Indians, mainly Mississauga Ojibwas. Exactly what happened during the winter is not clear, but Ramsay obviously did not get along with his clients. He later claimed that the Indians had repeatedly threatened to kill him if he did not give them rum. The Indians said that he had been “drunk and mad” all winter. In March Ramsay killed and scalped a warrior named Wandagan and two women while the rest of the band was absent. The brothers then fled as far as Long Point, on Lake Erie, where some Mississaugas caught up with them. The Indians tied them up but then began drinking. Getting loose, Ramsay killed and scalped five of the party, including a woman and a child. He and his brother proceeded to Fort Erie (Ont. ), where Ramsay was arrested and sent to Fort Niagara and then to Montreal. Ramsay claimed that he had acted in self-defence but the British authorities responsible for the west were incensed. Sir William Johnson*, superintendent of northern Indians, bitterly observed, “Killing a Woman and Child, and then Scalping them afterwards is inexcusable, and the Circumstance of his being able to do all this, is an evident proof that he was not in the danger he represents, and that the Inds. were too much in Liquor, to execute any bad purpose.” Johnson was well aware, however, of the ways of white juries in cases of crimes committed against Indians. “I don’t think he will Suffer, had he killed a Hundred,” he wrote and Ramsay did not. Despite the efforts of the British commander-in-chief, Thomas Gage*, who informed Johnson “I am trying all I can to get Evidence, for if what is related concerning his Cruelty is true no wretch ever more deserved the Gallows,” a Montreal jury acquitted him for want of evidence. “I am to presume that nothing was left undone that could be effected to bring Mor Ramsay to that Punishment his atrocious Crime deserved,” wrote the secretary of state for the American Colonies to Lieutenant Governor Hector Theophilus Cramahé*. 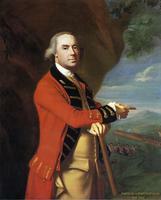 During the American revolution Ramsay served again in the Royal Navy, but once that conflict was over he returned to live among the relatives of the Indians he had killed. The Mississaugas resented his presence, but fearing British retaliation if he were harmed, they simply insisted that he pay the relatives of his victims a certain amount in goods and rum. When the Indians were drunk, however, they still threatened revenge. In 1793 at the rapids of the Miamis River (Maumee, Ohio), a son of one of his victims intended to kill him, and he was put on a boat for Detroit (Mich.) by Indian agent Alexander McKee*. Ramsay’s relationship with the Mississaugas was indeed a complex one. Although he remarked to Patrick Campbell*, a Scottish traveller for whom he was a guide in 1792, that “there was no dependence to be placed in an Indian,” he wrote out a petition on behalf of the Mississaugas in the winter of 1793. As late as 1795 he was reported to be living among them – presumably on the sizeable tract of land between present-day Hamilton and Oakville that he had persuaded them to give him in 1789. 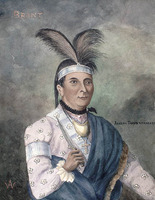 Moreover, following the murder of Mississauga chief Wabakinine* by a soldier in 1796, Ramsay wrote a letter in support of his sons’ petition for compensation in land. 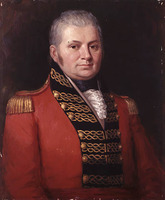 According to Lieutenant Governor Simcoe, he was an adopted Indian. In the white community Ramsay enjoyed a measure of respect. When Campbell met him he was earning his living carrying dispatches and money for people in the Niagara area. In July 1791 the Executive Council had approved his application for a grant of 600 acres and in 1801 he acquired lands in Kent County. When in 1810 he made out his will, he owned a brig, the Thames of New York. AO, RG 53, ser.1, A, doc. A7 [bound between p.14 and f.1]. PAC, RG 1, L3, 423: R2/7; RG 8, I (C ser. ), 251: 116. PRO, CO 42/32: f.27. P. Campbell, Travels in North America (Langton and Ganong), 191–206. Corr. of Lieut. Governor Simcoe (Cruikshank), 4: 114. The documentary history of the state of New-York . . . , ed. E. B. O’Callaghan (4v., Albany, N.Y., 1849–51), 2: 994. Johnson papers (Sullivan et al. ), 8: 130, 483–84, 497, 512; 12: 967. “Petitions for grants of land” (Cruikshank), OH, 26: 359. [Kahkewaquonaby], Life and journals of Kah-ke-wa-quo-na-by (Rev. Peter Jones), Wesleyan missionary (Toronto, 1860), 185. John Long, Voyages and travels of an Indian interpreter and trader . . . (London, 1791), 147. E. A.-Owen, Pioneer sketches of Long Point settlement . . . (Toronto, 1898; repr. Belleville, Ont., 1972), 39. J. H. Coyne, “David Ramsay and Long Point in legend and history,” RSC Trans., 3rd ser., 13 (1919), sect.ii: 111–26. F. C. Hamil, “David Ramsay and the Lees of Kent County,” Western Ontario Hist. Notes ([London, Ont. ]), 2 (1944): 13–15. Donald Smith, “The Mississauga and David Ramsay,” Beaver, outfit 305 (spring 1975): 4–8. Donald B. Smith, “RAMSAY, DAVID,” in Dictionary of Canadian Biography, vol. 5, University of Toronto/Université Laval, 2003–, accessed April 24, 2019, http://www.biographi.ca/en/bio/ramsay_david_5E.html.